Leeds United fans applaud the team off at the end of the Millwall game. After going into last weekend chasing the top two the Whites are back in second place, two points above rivals Sheffield United after an incredible double turnaround in last Saturday’s matches. With the Blades winning 2-1 in their game with Bristol City and Leeds 2-1 down at home to Millwall going into the last 20 minutes it was looking like a big day for the South Yorkshire side. 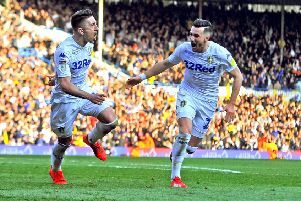 But in twists you could not script both games were turned on their heads by 3-2 results and for Marcelo Bielsa’s men it was a huge confidence booster after they had lost to their Sheffield rivals in their previous match. Leeds certainly put their fans through the ringer in a game in which they dominated yet again without taking their chances – even seeing a penalty saved this time. Defensively they never looked secure despite Millwall attacks being sporadic after the first 15 minutes so when Patrick Bamford’s tame spot kick was easily saved by David Martin, who was formerly on Leeds’ books, it had the feel of one of those days and the tension appeared to be getting to the home players. But it was to their credit that the Whites kept going to turn it round with Pablo Hernandez and Luke Ayling proving inspirational figures in the stirring fightback. More heroics will now be needed in the remaining seven matches, starting with a trip to Birmingham City to play another team that will not be lacking in motivation. With Garry Monk as their manager City would have been fired up any way for the contest, but more so now after a recent nine-point deduction left them battling to avoid relegation rather than looking at a late bid for a play-off place. United should need no reminding that the Blues can be a dangerous side as they were the first to lower the Whites’ colours at home in the league this season when winning 2-1 at Elland Road in September. Leeds could be close to full strength for the game, however, with striker Kemar Roofe on the recovery trail. If declared fit he will be a big candidate to come straight back in with Bamford the most obvious to be left out after looking out of sorts in the last two matches. Left-back Barry Doouglas has been ruled out, however, and his season looks over after he ruptured knee ligaments in last Saturday’s game, when he bravely played on with the injury. While Bielsa’s men are playing on Saturday there will be plenty of eyes on Sheffield United’s game at the same time as they face a tough-looking match away at a Preston side pumped up after seeing their impressive unbeaten run ended last weekend. With Leeds also having to go to play-off candidates Preston next Tuesday it seems the Lancashire club could hold the key to the Yorkshire clubs’ automatic promotion claims. They have beaten Norwich at home this season so know how to beat the best sides and it will be a massive feather in the cap of either the Whites or the Blades if they can come back from Deepdale with all three points.